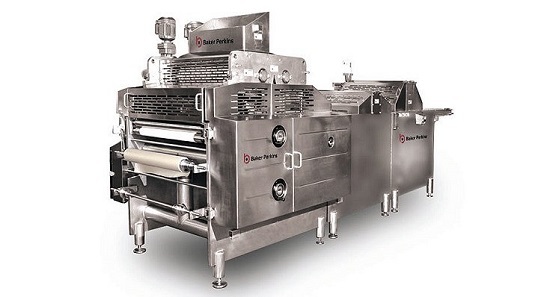 Baker Perkins introduced a new bread dough forming system at IBIE in Las Vegas in October. A key feature is flour-free operation that eliminates dust from this part of the bakery, with a reduction in operational, cleaning and maintenance costs, and the elimination of cross-contamination risk. The system comprises divider, rounder, flour free conveyor/resting system, and a Multitex4™ moulder. The system was shown with a Baker Perkins Accurist2.1™ ram-and-knife divider and conical rounder, but is equally compatible with an extrusion divider and bar rounder. No flour dusting is required on any part of the process. Even the stickiest dough pieces are prevented from adhering to the rounder, conveyors and moulder by a combination of process conditions, equipment design and choice of materials. Not only does this reduce ingredient, cleaning and maintenance costs, it also removes a hazard from the bakery atmosphere. Baker Perkins’ Multitex4™ moulder handles the dough pieces very gently, which gives bakers precise control over the final structure of the loaf. This gentle handling preserves the cell structure developed in the mixer, so the dough proves and bakes well to achieve the required shape, volume, colour and softness while using less yeast and improvers. With the same recipe, these quality characteristics may be improved. Hygienic operation and rapid repeatable changeovers contribute to exceptionally high operational efficiency. Production costs are further reduced because the gentle handling eliminates the sticking and smearing that lead to jams and means that a lot less cleaning and maintenance are necessary. 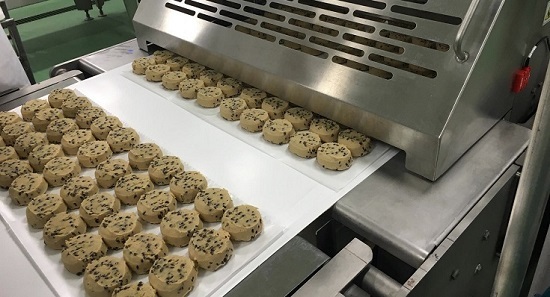 For the cookie and cracker sector, Baker Perkins exhibited a new servo-driven version of its well-proven TruClean™ Wirecut. The servo-driven wirecut mechanism brings improved automation and flexibility to the production of wirecut cookies. 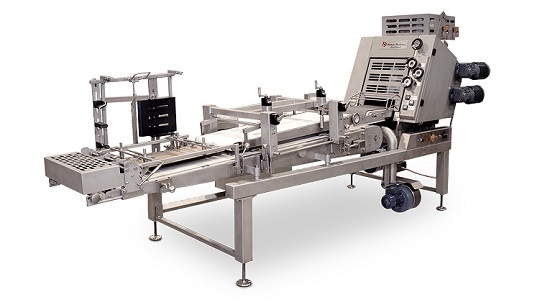 A two-axis servo system provides infinite variability to the cutting and return paths, enabling optimum cutting performance to be achieved at high speeds or on difficult dough. Tailored profiles can also be created for each individual product and loaded at the touch of a button. 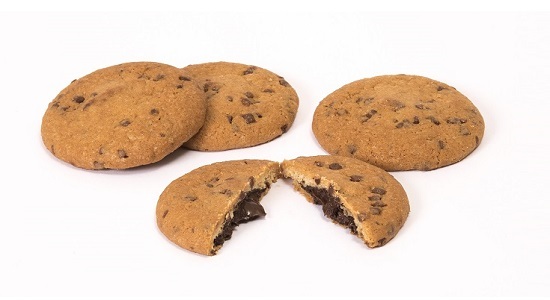 Filled cookies can be produced on a standard wirecut machine using a new encapsulation module and iris cutter. 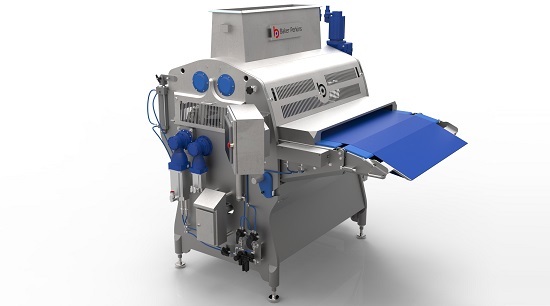 Baker Perkins’ encapsulation system is an optional modular unit that can be fitted to any wirecut to convert the machine from a standard unit to one that can do both cookies and encapsulated cookies. Fillings can include any ingredients which are low enough in viscosity, including chocolate, caramel, cream, peanut butter or jam. 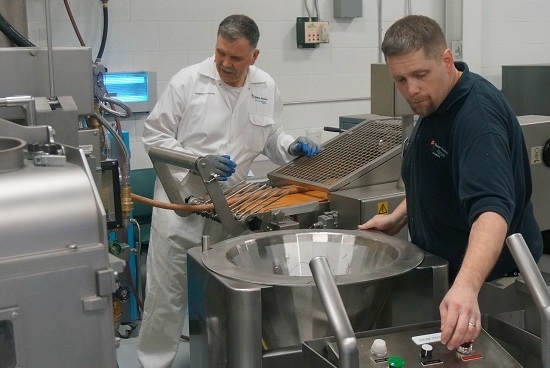 Baker Perkins has completed upgrading its range of sheet forming and cutting lines for crackers and snacks to TruClean™ standards, bringing major benefits in maintenance and hygiene, with lower costs and faster changeovers. On display at IBIE was a NEW TruClean™ Three Roll Sheeter and Gauge Roll for crackers and snacks, as well as a new TruClean™ Rotary Moulder for cookies. 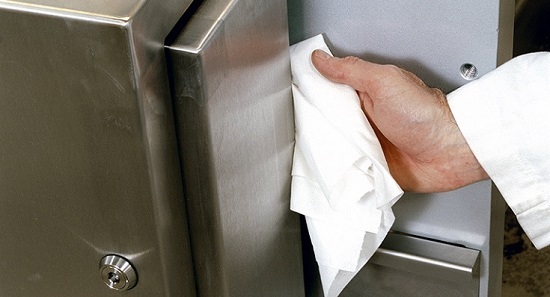 The TruClean™ approach to hygienic design was instigated to meet a clear demand from the industry for higher standards; time for a typical cleaning routine for a line can be reduced by up to 40%. There will be a focus on the latest technology to produce frozen dough for soft cookies. Baker Perkins is the market leader in technology to produce this favorite take-away treat, baked at the point-of-sale. 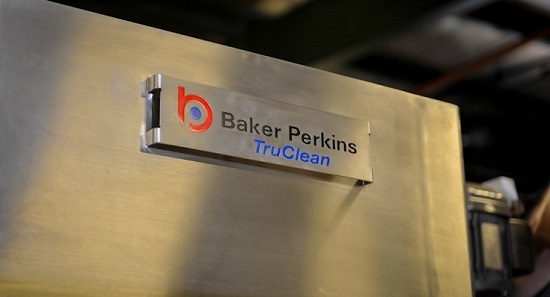 Baker Perkins’ Frozen Dough Machine is based around the TruClean™ Wirecut, with a series of standard modules for topping and paper handling. This Wirecut brings the freedom from allergens and other cross-contamination issues essential to frozen dough producers, who have no control over the baking of their product. Three additional modules are available for topping, paper cutting and paper slitting and these are combined to create up to six versions for each width. The two industry-standard choices of bulk packing or depositing onto paper are both catered for. Frozen dough cookies come in a range of sizes and flavors in most types of soft dough; to add value, inclusions are easily added. 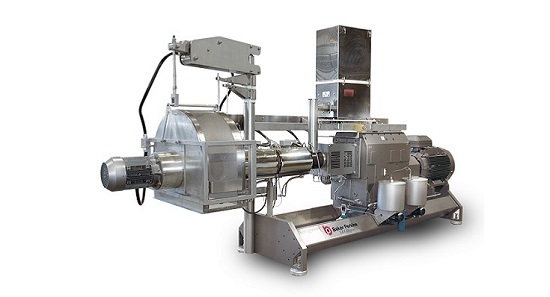 Baker Perkins highlighted innovative, cost-effective twin-screw extrusion techniques that bring flexibility to making foods previously produced by conventional bakery and cracker processes. An SBX Master™ extruder was on the stand. Possibilities include extrusion of a thin, wide sheet of dough that is cut into regular, geometric shapes by an in-line rotary cutter. The shapes may be fried as a conventional snack, or oven baked for a lower fat content. 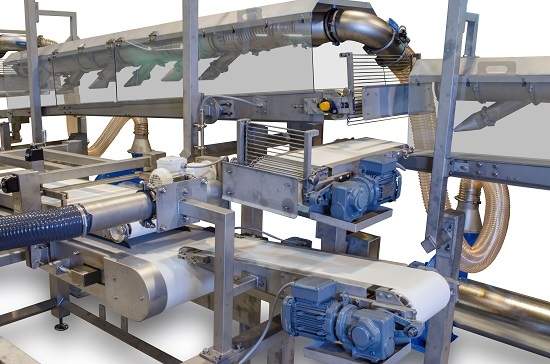 The conventional production method uses sheeting, gauging and rotary cutting equipment. An extrusion system is much more compact and flexible: a line can easily be configured to make a wide range of different snack products. A bread-like dough is the base for a more economic way of manufacturing flavored croutons than the standard process based on mixing, forming and baking of bread dough. Extrusion produces crispbreads more simply than the traditional method; crispy pieces for cereals and cookie pieces for chocolate bars and ice cream benefit from the simplicity of extrusion; bar sized pieces can be produced with one or two fillings. Extrusion is an ideal way to make gluten free, high protein and high fiber snacks. Extrusion is perhaps the most versatile process available to the food industry. It can create a wide range of end products from a variety of different ingredients and switch rapidly between them. It can replicate products made using other, less flexible, methods and the breadth of process options offers product developers plenty of scope for innovation. If it is possible to make a product in an extruder, it is almost certainly the most efficient and cost-effective way to make it. All the action is in the short barrel – ingredients in, products out seconds later. An SBX Master™ in the Baker Perkins Innovation Center at Grand Rapids, Michigan, is available for customer trials.